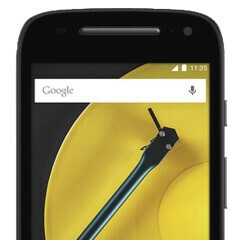 The second-generation Motorola Moto E, with support for 4G LTE connectivity, is now available for Verizon's pre-paid customers at a fantastic low price of $99.99. 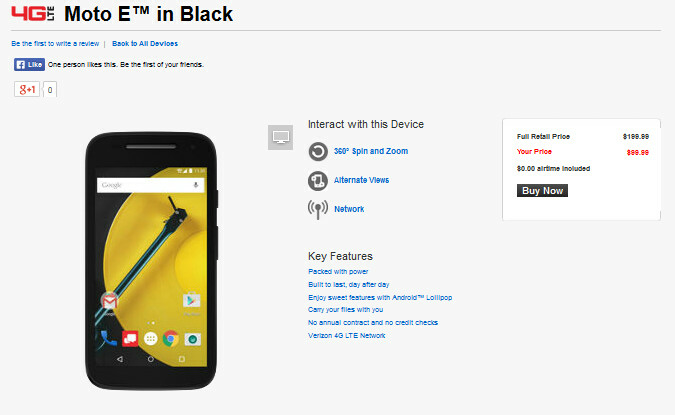 That is a pretty nifty discount from the $149.99 that Motorola itself charges for the phone. Just the other day, we told you that pre-paid carrier Cricket was offering the same model for $129.99. For under $100, you can pick up a phone powered by a 64-bit quad-core Snapdragon 410 CPU. And Android 5.0 is pre-installed. While 8GB of native storage doesn't give you much wiggle room when it comes to memory, the phone does come with a 32GB capacity microSD slot. The 2390mAh battery is not too bad for an entry-level phone. And the Moto E is splash-proof thanks to an application of nano-coating technology. Verizon's pre-paid plans start as low as $45 a month for unlimited talk, text and 1GB of Data. For $60 a month, you receive unlimited talk, text and 2.5GB of data. And if you make your payments using auto pay, Verizon will tack on an additional 500MB of data each month. Not bad for a 64 bit smartphone. Can I use this phone with more everything plan? Boost mobile which uses the Sprint network has the exact same phone for $99.00 with an unlimited monthly plan including data for only $35.00 a month so why pay more per month if you don't have to? Why? Because some people value coverage over cheap data. Sprint's coverage where I live and work is horrible. Verizon works the best where I live and work. 12.3mm thick. Man this phone is fat!